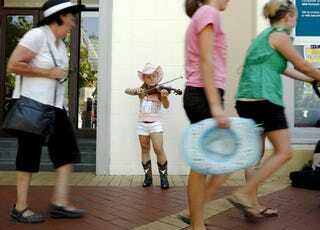 Here's a cute story about a 9-year-old violist who's been winning hearts at a busker festival in Australia all to earn enough cash to buy herself a Playstation. Carissa Lynch, of Kootingal, hit Tamworth's buskers alley on Friday, earning $149 by Saturday afternoon. By Monday she had earned about $350. It sounds like she might be able to upgrade her goal from a Playstation 2 (she says she only needed $150) to a Playstation 3.